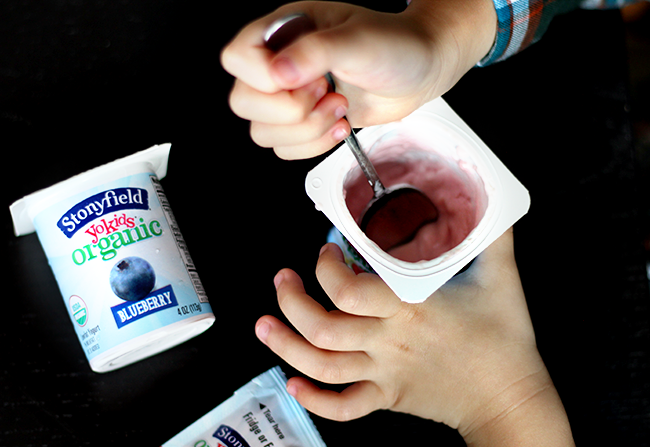 This post is in partnership with Stonyfield® Organic YoKids® Yogurt. Now that Essley goes to preschool for longer days, she always comes home asking for a snack. For the first month or so, her immediately request was usually a cookie or something filled with sugar. (What can I say? This child inherited her mother's sweet tooth. I'd eat candy for every meal if it were healthy.) Instead of giving in, I'd offer her a carrot or apple. At first, she was cool with this, but she quickly became bored (such is the nature of an almost 4 year old) and would opt for not eating at all over eating a wholesome snack. I quickly realized I needed to change things up. I ended up talking to my mom, who somehow raised my sister and me on a diet of health conscious, low sugar food in an era where our classmates' lunch boxes contained bologna on white bread sandwiches, cheese puffs, and packaged pastries. My biggest question for her was how she convinced young kids to eat snacks that weren't loaded with sugar and preservatives. Her answer was simple: she made it fun. The next day, I had an idea. When Essley came home from school, I cut an apple in half, made a slit about half way down, dabbed small pieces of peanut butter (sunflower seed butter is a great nut-free alternative) on it, covered those dabs with raisins, and cut two small pieces of a baby carrot that I then inserted in the top. I sat her down, put the "ladybug" on a plate in front of her along with a container of Stonyfield® Organic YoKids® yogurt in Strawberry Vanilla (her favorite), and the girl was stoked. I mean, so excited. She took her new ladybug friend for a swim in the YoKids® yogurt (dipped it in), and ate it up. Win win! Admittedly, it was just as fun for me to make the yogurt swimming apple ladybug as it was for her to eat it. And since then, I've continued to find creative ways to make her (and her little brother's) snacks fun, using organic foods that don't have excess sugar. Other things we've done have included apple "doughnuts" (core an apple and then cut into slices) topped with YoKids® yogurt and blueberries, toast "bears" using toasted whole grain bread topped with YoKids® yogurt with bananas for ears and raisins for eyes, and "butterflies" using YoKids® Squeezers as the centers and apple slices for the wings. 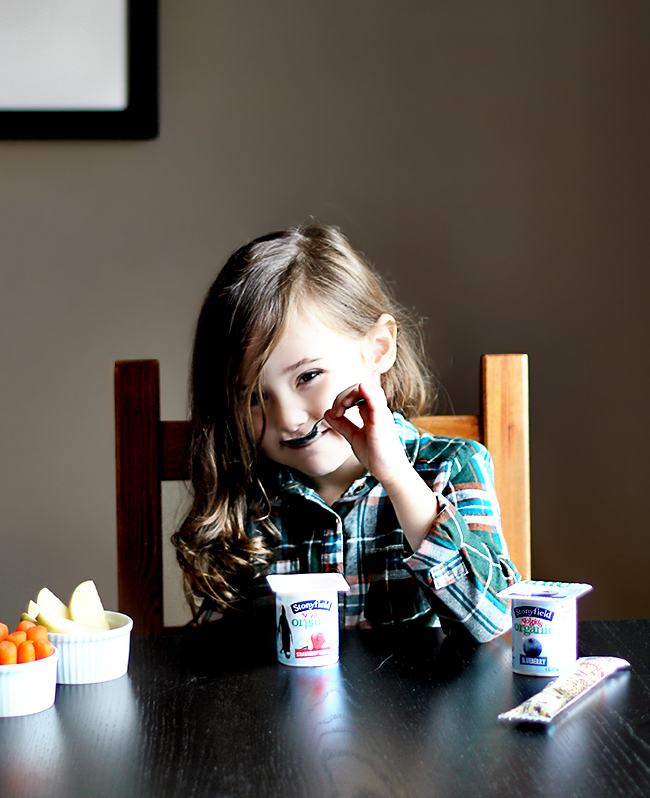 Both of my kids also adore eating Stonyfield® Organic YoKids® yogurt cups and squeezers on their own. They're perfect for travel and on-the-go snacking, or just as super easy, organic snacks that aren't packed with excess sugar. Essley and Emmett both love how they taste, and I love that they are certified organic and Non-GMO Project verified (meaning they're made without toxic pesticides, artificial hormones, antibiotics or GMOs). Organic certification is important to me - just because a product is labeled as "natural" doesn't mean it's without potentially harmful ingredients. 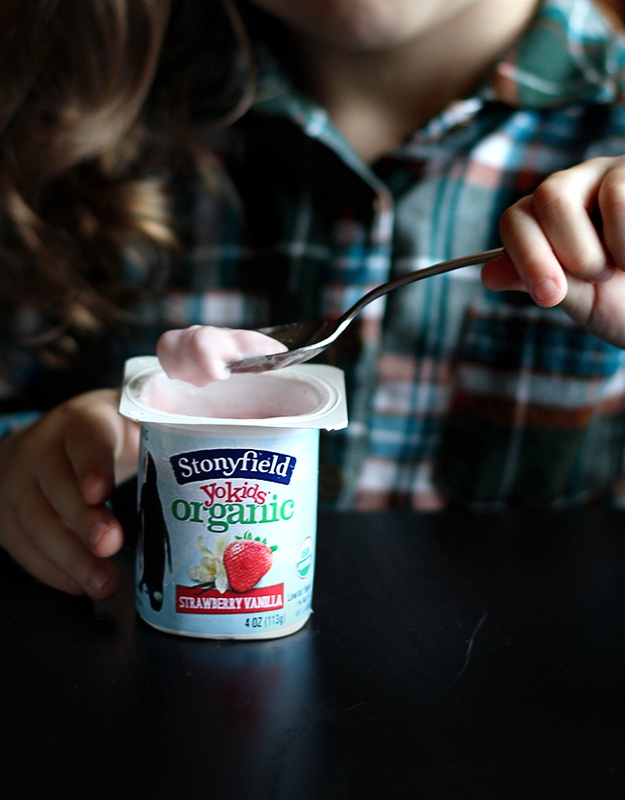 I'm also a big fan of the fact that Stonyfield recently announced a sugar reduction across its yogurt portfolio (starting with YoKids®), so that their products now contain 25% to 40% less sugar that the leading kids' yogurt. It's also great to be able to purchase from a certified B Corp - which means the company has been verified to the highest standards of social and environmental performance, public transparency, and legal accountability. I feel that supporting this kind of brand is a way to teach my children about ways we can make conscious decisions with our dollars to help social and environmental causes. Feeding their minds and spirits in positive ways means just as much to me as feeding their bellies with wholesome foods. What about you? How do encourage your kids to eat healthier snacks after school? Have any fun or creative ideas you can share? 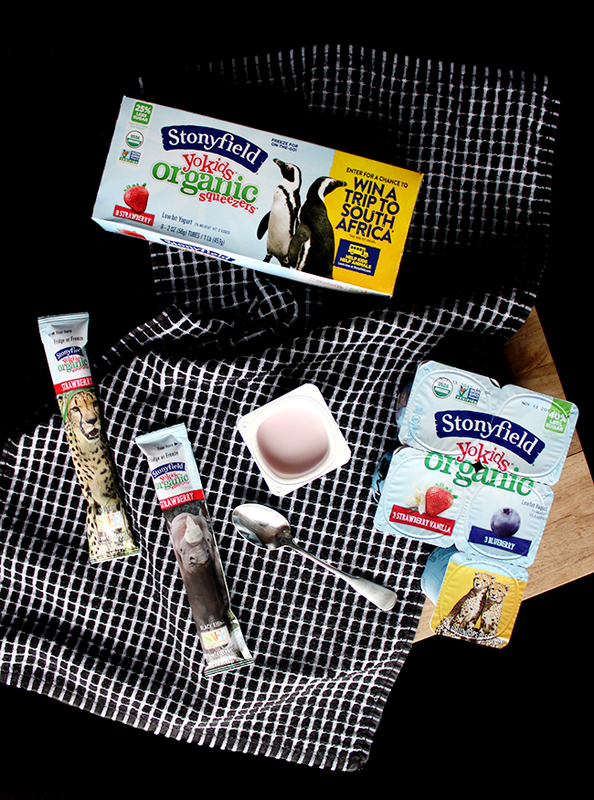 This post is in partnership with Stonyfield® Organic YoKids® Yogurt. Thank you for supporting the brands that help make Bubby and Bean possible. I need to try those squeezies! My kids love yogurt. The ladybug apple is so cute too! That lady bug apple! I love Stonyfield. My kids loooove that yogurt. 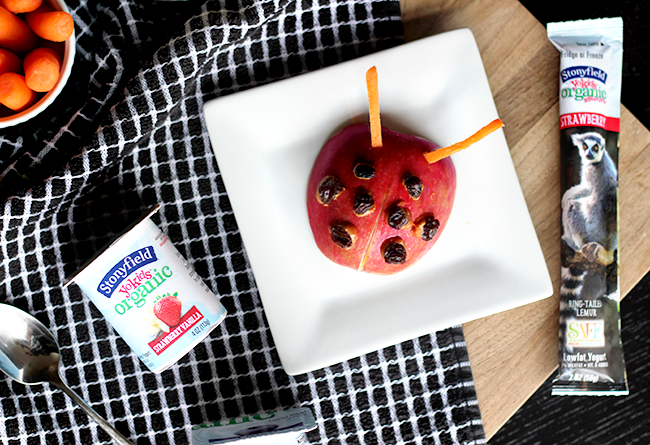 Also I’m totally going to make the Apple ladybug. Super cute!! I love lady bug apple! So creative and fun! I think it's great that you are teaching your kids to eat healthier and less sugar especially high sugars is so bad for our health. Thanks for sharing these ideas! I love that ladybug apple! I need more ideas like this!! My kids are pretty picky, so getting them to eat healthy is always hard! Great advice from your mom to make it fun! I needed to hear that for my picky earing kid. He has a sweet tooth too. Thanks for the tips! I love the way little kids hold spoons, its so funny! These are such fun snacks, maybe they'll start helping you make their snacks so you can all share in the fun of decorating different fruits with their yogurt! Those snacks are so cute!! I love the idea of making them fun yet healthy! We're a Stonyfields family over here too! 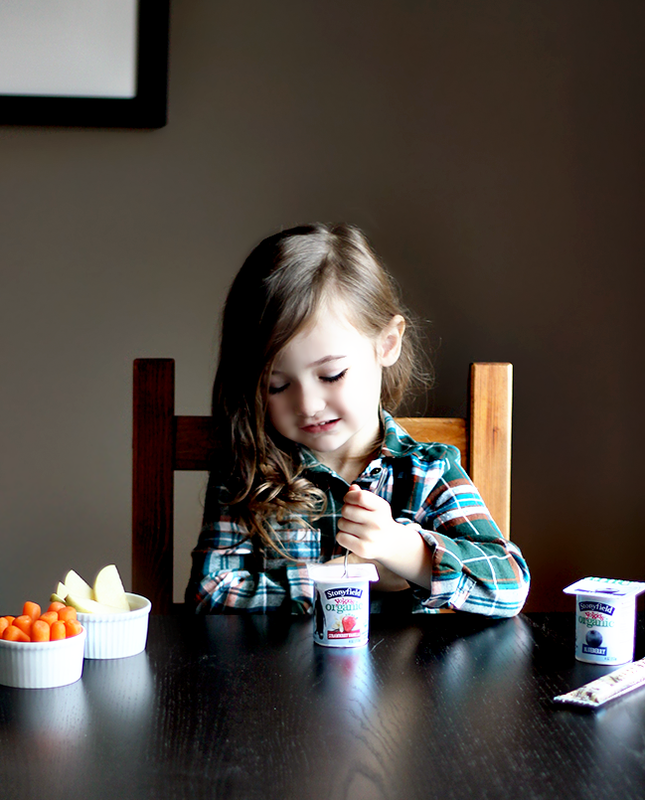 My toddler is such a picky eater, but yogurt is thankfully one thing I can get her to eat without any type of bribery! I also love so mix carrots or broccoli in pasta or muffins haha! My niece and nephew love fruits and veggies but these are so fun I can't wait to try! We love this yogurt so much around here! Need to make these adorable ladybugs for the girls. So so cute mama. 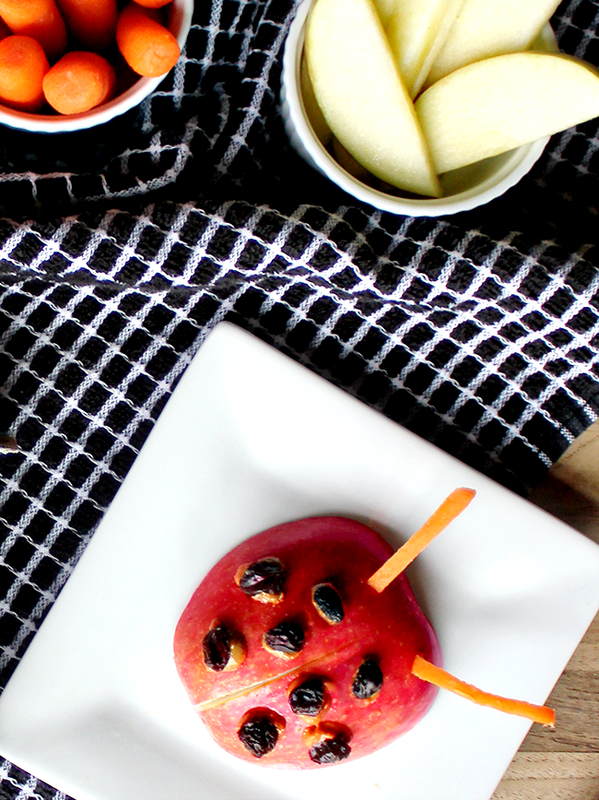 These snacks are perfect for kids! I love Stonyfield products! Such cute snacks!! Mom goals! hehe! These look like perfect healthy snacks! I'm all about organic and minimal/no sugar for my little one! 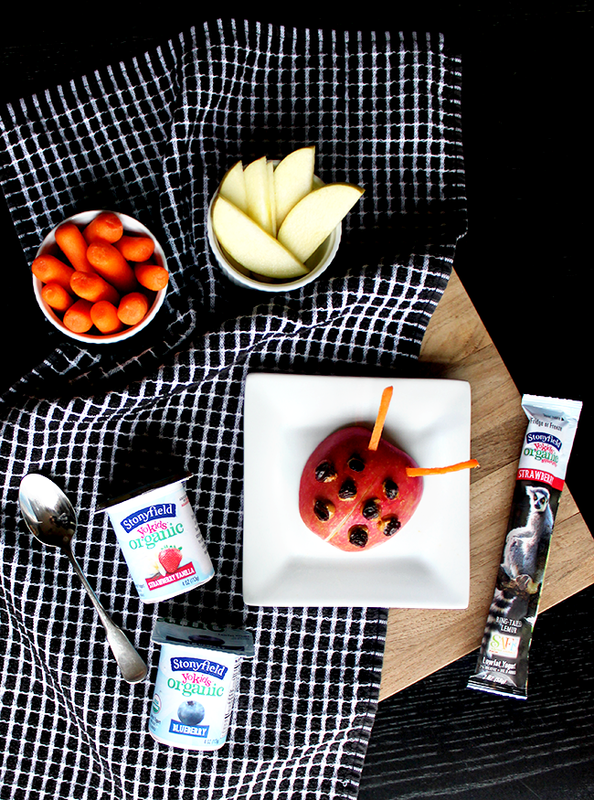 These snacks are so healthy and great for after school! I love the cute apple bug! My kids LOVE yogurt. I need to try out this brand.